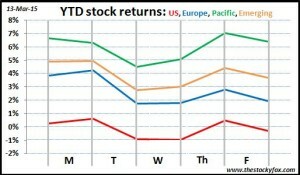 It’s been a great week if you’re an investor. US market performed the worst, being up only 2.7%. Wow!!! If that’s the worst performance, it must have been a really good week. 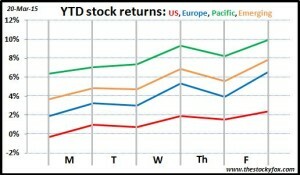 Europe rebounded from a tough last week and was up almost 5%. Pacific and Emerging were in between, being up 3.6% and 4.2% respectively. So what caused it all? The biggest market move of the week was when US Fed Chairwoman Janet Yellen released a statement saying that the Fed would remove the word “patient” from their statement on when they would raise interest rates. In practical terms that opens the door for them to raise interest rates in the next month or two, so on the surface that should be negative for the markets. But she was quick to stress that removing the word didn’t mean that they intended to raise rates immediately. That was where the uncertainly lay—everyone knows that interest rates will go up, but it’s just a question of when. This was a huge relief for the market as you could see when they rose about 2% within seconds of Yellen making her announcement. Hmmm. Can you tell when the Fed made its announcement? Hint: it was on Wednesday. Last week the Euro was battered against the dollar. Such a violent move is never good for markets and it sent all of them down. Remember, markets really like stability and predictability, so that makes sense. This week the Euro recovered some of its losses, although it’s still down significantly from where it was at the beginning of the year. Who knows how long this is going to last? As always, the Greek epic looms over everything; yesterday the German Prime Minister had to intervene to make sure Greece is playing well in the sandbox with the others. Plus you have other major European economies that still have sluggish growth. I personally think that Europe has major systemic problems that need to get solved, the biggest being Greece and its implications for Euro membership, but at least it isn’t in total freefall right now. 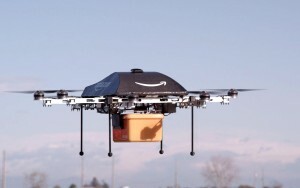 On Friday the FAA said it would allow Amazon to start testing drones in a limited fashion (only during day time, at limited altitudes, etc.). Amazon stock was up about 1.4% in a day when the markets were up 0.9%, so it’s not like it had a major impact. But I think innovations like this are what are really going to drive our economy forward in the future and create immense profits for the companies that can figure it out. Predicting the future is always hard, but you can easily imagine that there will be a day when a drone will fly any product you need to your door—groceries, carry-out Thai food, AAA batteries, library books, whatever. It will be events like this one which will pave the way to a pretty amazing future for us and the companies that figure out how to bring it to market. Enjoy this week. You don’t get a lot of these 3%+ weeks, so maybe take your significant other out to dinner or something. 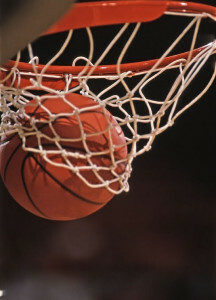 Have a great weekend, and my next post will be on Monday when I continue my March Madness investing tournament with Starting early takes on Tax optimization. After a thrilling contest between Index mutual funds and Free money yesterday, we are now pitting Mortgage against Savings rate. As always, I am not an expert on these matters. For most families, their Mortgage payment on their home is the single largest expenditure they have. Also, due to its nature as a commodity, it’s also one of the easiest places to really save a lot of money pretty painlessly. For a lot of products there’s a trade off between price and quality. A BMW 325 owner could pay $20,000 less and drive a Honda Civic, but there is a trade-off, either real or perceived, between those two cars. Sure you’re saving a lot of money, but you’re also getting not nearly as nice a car. Mortgages are very different because money is a commodity, so there’s no difference. If you get a Mortgage from Bank of America it acts pretty much identically as the Mortgage you get from Roundpoint (incidentally, the Fox family refinanced our mortgage—we used to be with BofA and now we’re with Roundpoint). Money is money so here you want to go with whoever can give you the lowest rate (there are some features that might be important like prepayment penalties or ability to refinance within a certain period of time, but in my experience those are pretty rare). Here we’ll use the Grizzly family as an example; they owe $400,000 on their home. One of the easiest ways to save money on a mortgage is by refinancing when interest rates go down. In the past few years, rates have been at historic lows and that means Mortgage interest rates have been similarly low. Let’s say the Grizzlys got their mortgage 5 years ago with a rate of 6%, but now they can refinance at about 4%. That alone would reduce the interest payments over the life of their mortgage about $175,000!!! That’s an incredible amount of money for going through a process that takes maybe a month from beginning to end, and probably about 5 hours of work on your part. As easy as this is, there are millions of homeowners out there who haven’t done this yet. You can move a little up the difficulty spectrum and save even more. Some Mortgages are sold with “points” which is basically prepaying interest; for example you might pay an extra $5000 when you get your loan and for that you would have an interest rate of 3.5% instead of 4.0%. Points aren’t very well understood and because of that a lot of people tend to stay away, but if you are planning on staying in your house for a long time, they can be the best money you ever spent. Using that above example, paying the $5000 to get the lower interest rate would net you a savings of about $35,000 over the life of the loan. Kind of the opposite of points are adjustable rate mortgages (ARMs). Instead of a 30-year fixed loan (the interest rate stays constant for the 30 year life of the loan) you could get a 5-year ARM where the interest rate is fixed for the first 5 years of the loan and then adjusts based on market conditions for the remaining 25 years. The benefit of these is ARMs tend to be about 1% less than fixed rates, but the major concern is that rates could rise after the 5 years is up and that could increase the cost of your Mortgage. In my opinion ARMs make sense if you don’t think you’ll be in your home for very long. In fact the Fox family is anticipating moving in the next few years, so we refinanced from a 30-year fixed at 4.0% to a 5-year ARM at 2.75%. Let’s say the Grizzly family did the same thing with their loan; that would equate to savings of about $15,000 for the first five years. Of course, after that they would either need to move, refinance their Mortgage, or deal with the uncertainty of a floating rate Mortgage. So all these seem to be pretty big numbers, especially since you aren’t really giving anything up to achieve them. But they aren’t going to be quite that big because interest on mortgages is tax deductible, so saving $100,000 in interest on the life of your mortgage may only put you ahead $60,000 because of the tax deduction. 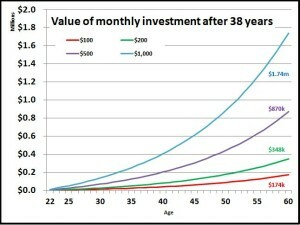 On the other side of the spectrum, you might end up with significantly more if you took those savings and invested them. Either way, your Mortgage is a great way to pad your nestegg. 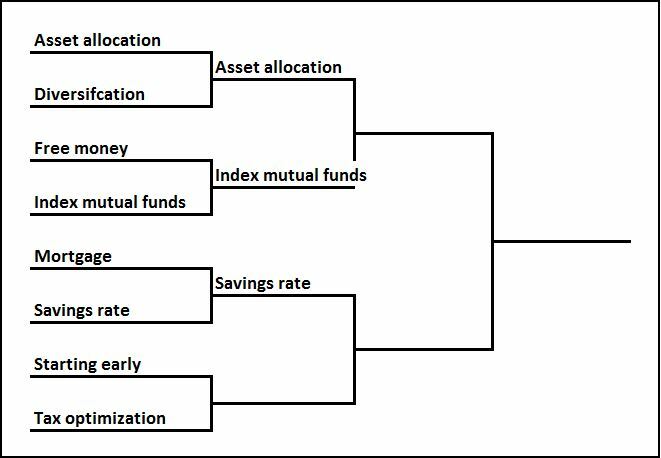 Savings rate is probably the most fundamental element of investing. You can’t really invest until you have saved some money to invest with (Gee Stocky, thanks for that tremendous insight into what we already know). And certainly, the more you save, the more you can invest, and the larger your nestegg will become. But how much can saving more really move the need? The impact can be pretty staggering. Over a 38-year period, from 22 when most of us enter the workforce, until we turn 60 and hopefully retire, if you invest $100 per month (assume a 6% return) you will end up with about $175,000!!! It’s not that $100 isn’t a lot of money (it definitely isn’t chump change), but that seems pretty incredible that such a modest amount every month can lead to such a large number at the end of the run. Over those 38 years, you would have invested a total of about $47,000, and because of investing returns you would have ended up with about 4 times that amount. And the math works so if you save $200 per month, you end up with about $350,000; $1000 per month, you end up with $1.75 million. Ladies and gentleman, say “hello” to the power of compounding. Mortgage gives it a good fight, but in the end Savings rate is able to generate numbers that are so much bigger. Also, while refinancing at a lower rate is a pretty sure-fire way to save money with your Mortgage, the more complicated maneuvers like buying points or using an ARM do entail some risk which could cost you serious dollars if you move too early or too late. On the other hand, there is really no way that saving more can hurt your nestegg. In the end Savings rate crushes Mortgage 65-51. I’ll do my usual week in review on Friday. 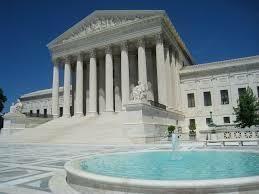 Then come back on Monday to see the final match of the first round, Starting early against Tax optimization. After a thrilling first day where we saw Asset allocation blow out Diversification, we are now on to day two where Free money will face off against Index mutual funds. As always, I am not an expert on these matters. Free money is . . . well . . . FREE. And obviously the more money you can contribute to your portfolio the closer you’ll be to retirement, the better you’ll be able to ride out stock market downturns, and the more financial flexibility you’ll have generally. I’m not telling you anything you don’t already know. In the US, by far the most common opportunity for Free money is the company match for your 401k. Typically it looks something like they will match $0.50 for every dollar you contribute up to 6% of your pay. And there are some companies that are even more generous; Medtronic has historically matched about $0.90 for every dollar up to 6% of your pay. Do the simple math and your average 401k match comes in at about 3% ($0.50 * 6%). Ever since I started working in 1999 I have always contributed at least enough to get the entire company match. If you do a quick calculation (assume you work from 22 to 60, with a salary that starts at $50,000 and rises to $100,000 over the years, with a 6% investment return), the value of that match is about $350,000. That’s not what your whole 401k would be worth, that’s just the value of the match!!! Not bad considering the median nestegg for a 60-year-old living in the US is about $140,000. So who says no to this? Sadly, about one-third of employees who have access to a 401k plan are “leaving money on the table” by not contributing up to the amount that their employer will match. This is some really low hanging fruit that is going unpicked. I get that there is only so much money to go around, but man, every dollar you’re putting in gets you another $0.50 of FREE MONEY. That’s a guaranteed 50% return; there are a lot of investors who would give their first born for something like that (Foxy Lady just instructed me that I am not allowed to give away Lil’ Fox for a 50% return–damn). Index mutual funds are mutual funds that mimic an index like the S&P 500, Barclays Bond index, FTSE Global Cap, or the MSCI US REIT index. That may sound confusing—the point is these mutual funds find an index already established in the market and do their best to copy it exactly. Index fund advocates, and I count myself among them with probably about 95% of the Fox’s nestegg in Index mutual funds, believe that these funds actually perform better than actively-managed mutual funds (an actively managed fund is one where the mutual fund manager picks individual stocks or bonds that he or she believes will out-perform the general market). I personally think the data here is mixed to slightly favorable for index mutual funds (mostly because of tax implications), but that is a pretty deep discussion probably for another blog post. For this analysis, I’ll assume that actively managed mutual funds and index mutual funds return the same amount. The undeniable advantage of Index mutual funds is their lower management fee. Like all things, mutual funds charge a fee for their services; it is a percentage that the fund managers skim off the top to pay for managing the fund. For actively managed funds that fee averages to about 1% with some higher and some lower. This goes to paying for all the research done, salaries for the different teams, brochures and disclosures, travel to different conferences, etc., and it tends to be a pretty decent chunk of change. For Index mutual funds, you really don’t need all that because all the team is doing is tracking a pre-existing index; because of this management fees tends to be fairly low—in the 0.05% to 0.2% range. Remember The power of a single percentage? We actually called out mutual fund management fees there as ripe for a 1% coupon. Running the numbers using the same scenario we just used for Free money (assume you work from 22 to 60, with a salary that starts at $50,000 and rises to $100,000 over the years, with a 6% investment return), that 401k account using a index mutual fund with a fee of 0.2% would leave you with about $990,000. An actively managed account with a fee of 1% would leave you with about $820,000. That a difference of $170,000 in your 401k over the course of your investing career. But that’s just for one account. Index mutual funds can be used for pretty much all your investing accounts—401k, IRA, 529, brokerage. Also, they can be used throughout for investing career, from the time you open your first account as a youngster all the way through the end when you shuffle off this mortal coil and leave some cash to your loved ones (more cash than you would otherwise because you were paying lower fees). This turned out to be much closer than I anticipated. At first I figured that Free money would win this going away, but Index mutual funds definitely came to play. Free money has a power effect (about 3% of your salary on average), but that is generally limited only to 401k accounts, only to the first 6% of your compensation, and only while you are working. Even with all those limitations, it makes an enormous difference over your investing lifetime. Index mutual funds have a smaller impact but a much broader application. You can use them on every account, with every dollar invested, for every year you’re investing. In a game that came down to the absolute wire, I think Index mutual funds barely edges out Free money in a Bryce Drew-style miracle finish. The final score, Index mutual funds 70, Free money 69. Ultimately I think Index mutual funds and that lower management fee will save more of your money in every corner of your investing portfolio, and that will ultimately lead to a bigger impact on your nest egg. I hope to see you tomorrow when your Mortgage takes on Savings rate. 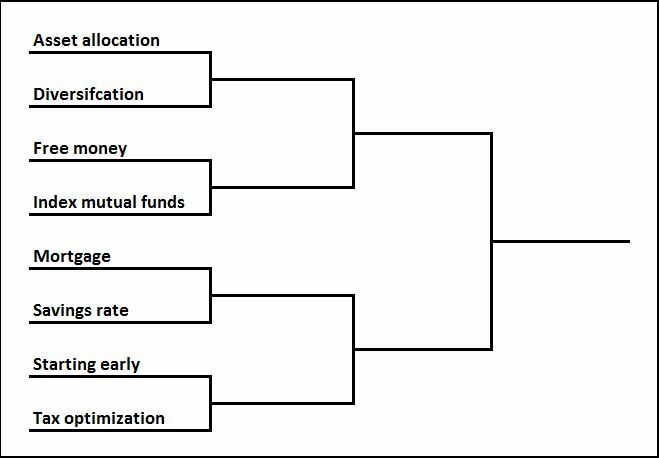 We’re ready to kick off the investing strategy tournament to determine which is the single best investing strategy if you could only pick one (which fortunately isn’t the case–you can pick all these). As always, I am not an expert. 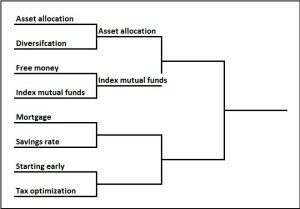 So without further ado, we’ll start with the contest between Asset allocation and Diversification. Asset allocation is picking the right mix of stocks, bonds, and cash which maximize your investment returns while also limiting that chances that you hit a bad patch of time which cripples your portfolio beyond recovery. The basis of the concept of asset allocation is the fact that as your expected investment returns increase, so does its volatility. So for example, cash (or money market accounts) are the least volatile investments around where the chances of you losing money are nearly zero, but they also offer the smallest return at about 1-2%. On the other end of the spectrum are stocks which historically have averaged about an 8% return, but where about one-third of the years you lost money. Bonds are between those two, both in terms of returns and risk of losing money. In my experience screwing up Asset allocation, especially among young investors, is one of the most common missteps. The conventional wisdom is that you want to take more investing risk when you’re younger because you have more time to “recover” from any market downturns (as was the case with me in 2001 when I was just starting out). That means that typically (and of course, each individual is different) younger people should allocate more to stocks than bonds or cash. However, so often I talk to younger investors who have a significant chunk of their 401k in bonds or worse yet, cash. Why is this so bad? Well, over a period of decades, the investment horizon when you’re in your twenties or thirties, you end up leaving a lot of money on the table. Using historic averages, if the 25-year-old you invested your 401k in stocks and your twin invested in bonds, when it comes time to hang up the spurs, it’s no contest—you’re so far ahead of your twin. Remember that historically, stocks have returned about 8% while bonds have returned 5% and money markets (cash) have returned about 2%. Just doing some really simple math, the historic difference between stocks and bonds has been about 3%–that adds up to huge differences over an investing career (remember from “The power of a single percentage” how big a difference 3% can make?). Who knows if it will be like that in the future, but based on history that could lead to hundreds of thousands or even millions of dollars over time. Of course, you probably read A Random Walk Down Wall Street, so maybe you’re saying, “but when you invest in stocks you’re only getting a higher return because you’re talking on more risk.” There’s no such thing as a free lunch, and right you are. That argument is exactly why Asset allocation is so important. If you were 60 years old and getting ready for retirement, it probably wouldn’t be a good idea to risk losing a big chunk of your portfolio by investing the majority of your money in stocks. But if you’re 20 or 30 years old, then you can invest in stocks to get the higher return knowing you’re at less risk of a catastrophic loss because you have three or so decades to ride out any storms. 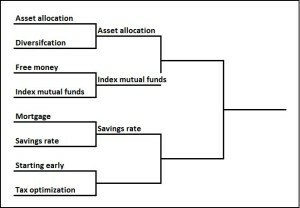 Diversification is the strategy of picking multiple investments so that you can reduce the volatility of your portfolio. When some of your investments are down, others will be up. This is really Investment 101 stuff, and I don’t think you’ll find many legitimate investors who would not say it’s a good thing. But if you think about it, how much is Diversification really doing to help you achieve your financial goals? The fact of the matter is that Diversification does not increase your investment returns, on average (“on average” is a critical phrase here). If that’s true, then why does everyone make such a big deal about diversification? Because by diversifying with several stocks you even out the highs and lows that would occur with a single stock. As an example let’s look at investing in an S&P 500 index mutual fund which is considered highly diversified, and compare that to investing in a single stock. Here I picked Catepillar because from 1980 to today, it and the S&P 500 had largely the same performance (they were both up about 1000% over those 34 years). Over that time both investments had their ups and downs, but the difference was that Caterpillar’s ups were much higher and its downs much lower. Since 1980 (34 years), the S&P 500 index had seven negative years with its worst year being 2008 when it was down 39%. It also had 11 years where it had a return of 20% or better with its best year being 1995 when it was up 39%. Now compare that to Caterpillar over the same time, remembering that over the entire 34 years they both had total returns fairly similar to each other. Caterpillar had 15 years with negative returns, the worst being 2008 when it fell 55%. On the other side, it had five years where returns were over 55% (16% better than the best year of the S&P 500 index), with the best year being in 2010 when it increased 90%. So think about that. If you decided not to diversify and put all your money in Caterpillar, you would have ended up in pretty much the same place as your twin who diversified with the S&P 500 index, but you would have had a much crazier ride. 2008 would have sucked for both of you, but much more so for you than your twin. Also, almost half of your years would have been negative (15 out of 34 years) where it was only about 7 out of 34 years for your twin. Of course, that would have been offset by some real “bumper crop” years (I had to get a farming analogy in) like 2010 when your portfolio would have almost doubled. No one is complaining about a year like that, but it that a good thing? How do you plan for something like that? Pre-2010 you were probably figuring you’d have a moderate retirement, and then 2010 rolled around and life all the sudden got a lot sweeter. Just look at the graph—far and away the most common annual return for the S&P 500 index was the 0-20% bucket; for Caterpillar the returns were all over the board and the most common was -20% to 0%–a loss!!! And of course, I picked Caterpillar because over the 34 years it was pretty close to the S&P 500. Remember that if you picked a single stock randomly from a broad index like the S&P 500, you would expect the stock to do just as well as the index, because the index is just an average of a bunch of those stocks. And it’s true that on average a single stock will do as well as an index, but what if I randomly picked United Airlines which went bankrupt just like many, many other companies do every year (there’s no real chance that the value of the S&P 500 would go down to zero in a similar way)? Or if I picked Medtronic (one of the greatest companies ever) which outperformed the S&P 500 some 12x? My personal preference with investing is that I want as much predictability as possible, and that is even tough to come by when you’re highly diversified; when you aren’t diversified, there’s no chance. Maybe if you like those types of thrills that putting everything into a single stock brings, you may want to think about BASE jumping or free diving. 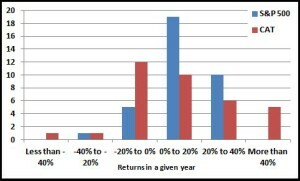 But assessing it honestly, Diversification does not lead to higher returns on average. It just reduces the crazy swings up and down. Asset allocation wins this one pretty easily, 86-59 (I just made that up to look like a basketball game score, but it seems about right). 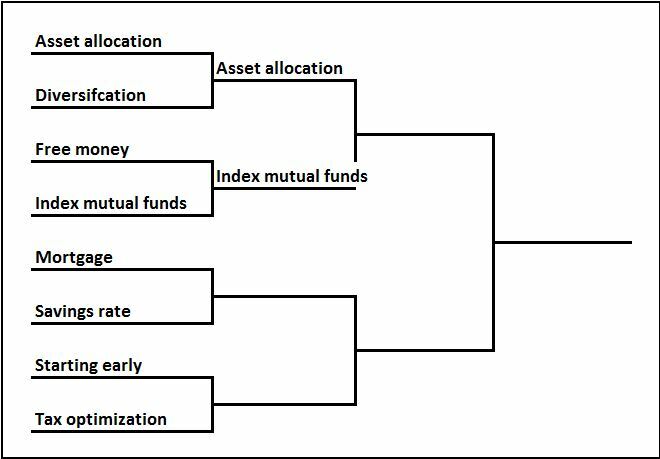 Diversification definitely helps smooth things out, but Asset allocation can undeniably increase your returns which translates to real money. 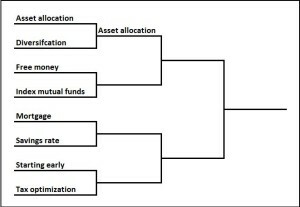 So Asset allocation moves on to theFinal Four. Make sure you come back tomorrow to see Free money take on Index mutual funds. March is here and that means so many good things—winter is giving way to spring, flowers are starting to bloom, and of course March Madness (the college basketball tournaments for those of you unfamiliar with the lingo) is starting. Normally I would totally consume myself with 10+ hours of games a day on multiple TVs at the same time, and Foxy Lady would become a basketball widow for the next three weeks (and that still may happen). But now that I’m doing this blog (plus Pitt didn’t make the tournament), I thought I would have a little fun and combine the two. So here is my tournament-style contest to determine what is the single best strategy/approach out there to help you build your personal fortune. I whittled it down to eight “teams” which will face off against each other until there is one champion. Asset allocation—investing your portfolio into different asset classes like cash, bonds, and stocks. Index mutual funds—choosing mutual funds that invest in broad indices like the S&P 500 or the FTSE. Mortgage—picking the best mortgage that gets you the house you want but pays the lowest amount. Saving rate—simply put, how much you’re saving every month or every year. Tax optimization—using tax advantages like 401k’s, IRAs, 529s, and other accounts out there that let you eliminate or defer paying taxes. Every day for the next two weeks I’ll break down the “game” between two of these investing strategies and determine which one, taken in isolation, will have the more important impact on your nestegg. But in this tournament there are no losers (I’m getting ready for when I start coaching Lil’ Fox’s little league), and certainly each of these principles is very, VERY important as you think about your investing strategy. How large of an impact could doing this right have on your nestegg? Are we talking about a few thousand dollars over the years, or could this amount to the millions? How commonly do people screw this up? Is this something that everyone is already doing (so thanks for telling us something we already know, Stocky), or is this something that most of us can probably benefit from? How easy is it to do correctly? Is this low hanging fruit that we can achieve with just a couple hours of work, or is doing this right going to require a huge time commitment and possibly a PhD in multivariate statistics? Put all those together, and I’ll try to pick which of the head-to-head strategies “wins” the game. I hope you have as much fun reading these next few blog posts as I had writing them. If you’re feeling particularly ambitious, go ahead and fill out your bracket and send it to me and we’ll see how well your picks line up with mine. What a crazy week on Wall Street. Tuesday we were down over 1%, Thursday we were up 1%, and then Friday ended the week down another 1%. Net for the week markets ranged from being about flat with Pacific was down only 0.3%, to really taking it on the chin with Europe being down nearly 2%. So what was the cause of all of this? The major news event that dominated the entire week was the major decline of the Euro to other currencies and specifically the dollar. Pundits spent the whole week debating if this was good or bad for Europe and good or bad for the US. 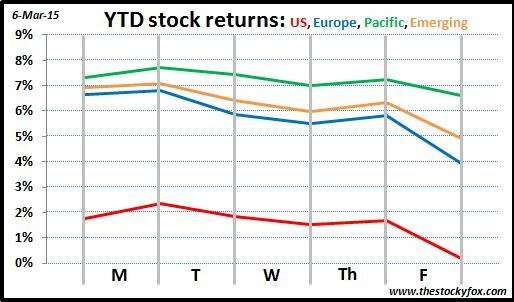 Based on the stock returns for the week, it seems like it’s better for the US—the US markets were down about 0.6% for the week while the European markets were hammered about 1.9%. The reason behind all this is if your currency depreciates it makes imports more expensive and your exports less expensive to other countries. So this is supposed to have a bit of a stimulus on your domestic economy because of a twin effect—exports from other countries are more expensive so your people buy domestic instead; also, your exports are more affordable abroad so foreigners buy more of that. So on the surface this should be good for Europe and bad for the other economies. But the deeper issue seems to be that Europe’s economy is not that strong right now, plus you have the nightmare situation in Greece which could potentially spread to Spain and Italy. Because of all that, the currency is in free fall, so when you evaluate things it’s true that the Euro depreciation should be good for the Eurozone economies from an import/export perspective, but that is more than offset for the negatives that are driving the value of the Euro downward. Any way you look at it, it sure made for a wild week and people swung back and forth from this being a good or bad thing. Undeniably, it makes the prospect of the Fox family taking a European vacation much more tempting since our dollars will stretch so much further. Apple unveiled its latest gadget, the Apple watch, on Monday including a $10,000 version if you really like the gold look. In general Apple is beloved by Wall Street and the general media so this story got tons of coverage. The consensus seems to be the product won’t be a blockbuster that will change the world, and the holy grail of a super-functional device that fits on your wrist but contains all the features of a smartphone is still in the future. If it’s such a disappointment, then why am I writing about it? 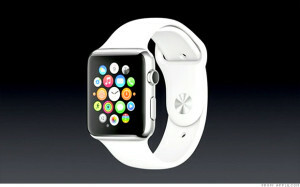 Although it remains to be seen if the Apple watch will hit the mark, it does represent some incredible innovation. Just like iPods changed our lives, and then iPhones and iPads, eventually this product or something like it will get traction and become a staple for us, creating tremendous value for its users and tremendous profits for the company that does it. And that is really the cornerstone of the American economy—innovation—and that is why I am always to optimistic about investing in stocks, even on really down weeks like this one. 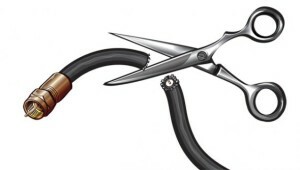 As if we needed to be told, numbers came out that showed that traditional cable television ratings were suffering in a major way due to streaming services like Netflix, Amazon Prime, and Hulu. Similar to the idea of the Apple watch, in this case people aren’t watching less video programming (see you can’t even say “watching television” anymore because there are so many different devices they could be watching on). Just some incredibly innovative companies are finding a way to make things more convenient, less expensive, and generally better for consumers. This has led to amazing stock performance for those companies at the expense of some of the traditional media outlets. As an investor, this changing of the guard will clearly have its winners and losers, but net-net you’ll come out ahead because a better product is being created which attracts for customers and leads to more profits. Again, the innovation engine is clearly chugging in the US and around the world, and that will lead to higher stock prices for those companies who can best bring those advances to markets. So there you have it. Some sour political/economic news out of Europe put a damper on the week, but I still firmly believe that the value creation is still occurring at an amazing pace. 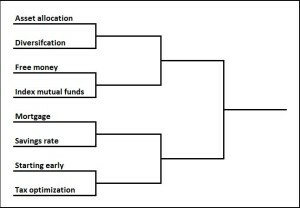 We won’t have a movie review tomorrow because next week I will have a post every day where I’ll be having a March Madness style tournament to see which investment strategy is the best. Hope you have a great weekend. Okay, you’re ready to join me in the land of financial freedom. 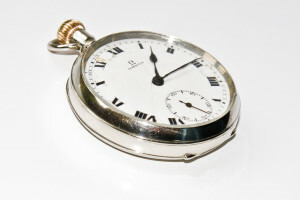 One of the first things you need to figure out your time horizon for the money you’re saving. Will you need that money in a couple months or sooner, in the next couple years, in the next ten years, or at retirement? These answers will have the greatest impact on how you invest it. Here is my take (and as always, I’m not an expert, and these are just my opinions; any predictions I make about the future are just based on historical trends, and you should establish your own opinion on the future). Your property tax bill, ‘Lil Fox’s preschool tuition payment, living expenses if you’re retired like Grandpa Fox. With such a short time horizon, you really don’t have a lot of options. For amounts less than $5,000, it’s probably easiest to keep it in your checking or savings account, even though the typical interest rates on those accounts are practically zero. Money market accounts would offer a little more interest, but even then you’d be looking at 2% or less, so it may not be worth the $1.50 per month in interest you earn on $1000 to set something up. If you’re talking a larger amount of money, you want something that has a very low risk of decreasing in value, but still offers an interest rate that makes the effort worthwhile. Short-term bond funds like Vanguard Short-Term Bond Index (VBISX) may fit the bill. There’s a pretty small chance that your investment will decrease in value (but it’s not 0% so be prepared), but you can still earn a decent ~3% interest; that’s about $25 every month for a $10,000 investment. Car fund because you have a 2001 Honda Civic with a bad transmission (the Fox family in June 2013), vacation you want to take to Hawaii without the kids two years from now. Because you have extra time compared to the “extremely short-term”, it’s definitely worth it to invest for any amount more than $500. Similar to above, you probably want a bond fund of some sort, but because of the extra time you can take on a slightly more volatile investment and grab the higher return. Something like Vanguard Medium-Term Bond Index (VBIIX) gives a decent return, about 4% historically, with a pretty low risk that you’ll lose more than you gain over a year or two. Just so you hear that “cha-ching” sound in your head, if you invested $1000 in a bond fund, after three years at 4% interest, you would have about $1125, a tidy little $125 profit earned for nothing more than being smart about where you put your money. That could fund those Mia-Tias on the beach in Hawaii while you remember all the extra free time you had before the kids came along. Mini Fox’s college fund, down payment on Mrs Fox’s dream vacation house down the shore. With a longer time horizon, your options really start to open up. A few years starts to give you the time to weather some moderate financial storms, but probably not enough to go fully into stocks (ask someone who invested money in October 1929 or November 2000). 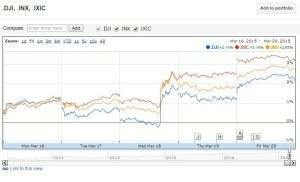 The winner is probably some balanced fund like the Vanguard Balanced Index Fund (VBINX). These balanced funds will have a mix of bonds, with the price stability they provide, and stocks, with the potential for higher returns those provide. For those closer to the 10-year mark or those willing to take a little bit more risk for a higher return, you could jump into an all-equity mutual fund like Vanguard Total Stock Fund (VTSMX). Mr Fox’s 401k, Mrs Fox’s IRA. Once your time horizon gets past 10 years, things start to get interesting and fun. Because this is where most of your savings for retirement should be (unless you’re Grandpa Fox, enjoying retirement), this is where I’ll focus most of my time. Also, because this is where you have the most options, this is where there’s the biggest risk that you can screw it up and cost yourself tens or hundreds of thousands of dollars over the years. While we can spend a ton of time discussing this (and believe me, I will) a simple starting point on where to put your money for something like this is the Vanguard Total Stock Fund (VTSMX). In time, we’ll discuss other investment options but this is a good start. In the cases of the medium-term and the long-term strategies, at this point you are truly entering the world of investing. Welcome. Your returns on any particular year can range from -10% or worse to 20% or better, and you can count on the fact that sometimes it will be a bumpy ride. Inflation, the general rise in prices over time, is a powerful and unrelenting force which is eroding the value of your money every year, every month, every day. 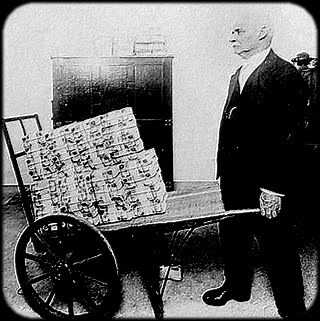 How powerful is inflation? Look at this simple example with my neighbors, Mr and Mrs Grizzly. If they want to spend $50,000 per year (in today’s dollars) in retirement they’ll need about $1.2 million on the day they retire (40 year retirement, 6% return, 3% inflation). Every year in retirement they’ll spend a little more than $50,000 to buy what $50,000 buys today because of inflation. However, if you crank the inflation knob up a notch from 3% to 4%, they’ll need $1.5 million. Up to 5%, they’ll need $1.8 million. What makes inflation so scary is that the impact is huge—a 2% increase requires your nest egg to be $600,000 larger—and it’s also completely out of your control. In the US, inflation is tracked by the Bureau of Labor Statistics, a division of the Department of Labor, with a tool called the Consumer Price Index (CPI). Basically (I know it’s much more complex, but for brevity’s sake) it looks at a general basket of goods that people buy and tracks how those prices change over time. It’s meant to track EVERYTHING that consumers buy: food, housing, cars, airline tickets, medical expenses, entertainment, and on and on and on. The US boasts an amazing record of tame inflation over the decades, but even then it’s been quite a roller coaster: in the early 1980s, according to the CPI, inflation was averaging about 12%, and it has averaged about 1.6% since 2009. That just ruined Mr Grizzly’s day. So he needs $1.2 million today to retire, but depending on inflation it could range from $1 million to $8 million if it got as high as it did in the early 1980s?!?!?! No bueno. How the heck is he supposed to plan for a range like that? The unfortunate answer is: there really isn’t a good answer. Inflation is going to do what it will do, and there isn’t a lot you can do about it as an investor. The US government sets an inflation target at 2%, but reasonable people can debate how good Washington is at managing stuff like this. When I do my planning for the Fox family, I personally use 3%. But there is some good news—I actually think the CPI waaaaaaay over estimates inflation and that it is going to be on the lower side of historic averages, which is a good thing for those of us saving for retirement (as always, this is just my opinion and may turn out to be quite wrong, also with my projections I am not predicting the future). The CPI is supposed to compare apples to apples, so basically what did you buy last year and how much would that cost if you bought the exact same stuff this year. I think over the short-term the CPI works pretty well; I’d believe that prices in 2014 were about 2% higher than in 2013 (in line with the CPI’s figures). But over longer periods of time, the CPI really fails because I think it does a really lousy job of dealing with major technological advances. So when you look at 10 or 20 or 50 years, which happens to be the time horizon we’re looking at for retirement, I think the CPI really overestimates inflation. If you go back to 1965 (I picked 50 years ago, because I figure I have 50 years to live, so that’s my time horizon), the CPI says prices have risen about 7.5 times. So something that cost $100 in 1965 would cost about $750 today. If you do the math, that equates to about 4.1% per year. We saw the impact that the level of inflation has in the above examples (pretty major impact), yet let me tell you why I think the government is getting it wrong and there is some real relief. This is going to be a long post (but I hope a valuable post), so get comfortable. In 1965 you could get a new 4-door sedan like the Chevy Impala for about $3000. Today you could get a new 4-door sedan like the Honda Civic for about $20,000. If you do the math, that calculates to about 3.9% inflation per year, right around what the CPI says (I know, you’re saying: “Stocky, so far I’m not impressed.”) But remember, the CPI is supposed to compare apples to apples; when you compare a 1965 Impala to a 2015 Civic, the Civic has a ton of advantages. The Civic gets 35 miles to the gallon, while the Impala got about 12. The Civic has incredible safety features like airbags, antilock brakes, backup camera, and on and on; the Impala has seat belts across your lap (they didn’t even have the shoulder ones). The Civic has Bluetooth to connect to your MP3 player, while AM/FM was an option on the Impala. A new Civic will probably last you 200,000 miles or more, but your Impala would be lucky to get to 100,000 (like “go-out-and-buy-a-lottery-ticket” lucky). Put all that together and how much of that 3.9% annual price increase is due to inflation, and how much is due to the Civic just being a better car? It’s not an easy question to answer, but I would think an awful lot of the price increase is because you’re getting a safer, more fuel-efficient, and more durable car . . . just a better car. 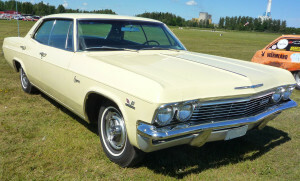 To look at it from a different angle, we know $3000 in 1965 would buy you a new Chevy Impala. What would $3000 buy you in 2015? A quick look at Autotrader.com shows that for $3000 you could get a 1998 Honda Civic with 150,000 miles. Between those two choices, each of which is $3000, don’t you have to pick the Civic as the better car? It’s safer, much more fuel efficient, has more convenient features (cruise control, automatic windows), and it will probably last longer. All that says that inflation was actually a lot less than the 4.1% the CPI said or the 3.9% we calculated. Housing is the biggest expense that people have, so how does that come into play? In 1965 the average rent was about $90 per month while in 2011 it was around $870 which calculates to about 5.1%. That’s higher than the CPI, but before we freak out about runaway inflation in the housing market, let’s do the apples-to-apples comparison. In 1965 you were getting a place where you might have shared a bathroom with your neighbor and a phone too. You had an icebox instead of a fridge (literally a cabinet that you kept cool with blocks of ice), and radiator heating. Today you have granite countertops and stainless steel appliances, central air conditioning, and a fitness center downstairs if you’re lucky. How much of that 5.1% increase is due to prices rising, and how much is due to you just getting a much, much nicer place with much better amenities? Today, I’m sure if you tried hard enough you could get a total armpit of an apartment that was completely vintage 1965, and I bet you probably wouldn’t pay more than a few hundred bucks for it, showing that prices for apples-to-apples apartments haven’t risen near that 5.1% level. Ahhhh. This is where you’re saying: “But what about healthcare? Medical prices are spiraling out of control. That’s where they get you.” The Medical CPI shows that prices have increased an astounding 17 times since 1965—about 5.9% annually. Mr Grizzly just had a minor aneurysm, which he knows is really going to cost him. But before you despair, do the apples-to-apples comparison and realize that the quality of healthcare has gone up exponentially while costs it can be argued have come down. Let’s say Grandpa Fox had a heart attack in 1965. First, his chances of survival weren’t very good, but let’s assume he survives and gets coronary bypass surgery. After two months of recovery he’s back at home living his normal life, but now with a sweet scar running all the way down his chest from the open-heart surgery. That surgery back then would cost around $6000 (it’s hard to find exact numbers on this so I estimated; any reader who has better data please let me know) which is a drop in the bucket compared to the $100,000 price tag bypass surgery costs today. Unfortunately, Grandpa Fox passed his lousy heart genes on to me. However, instead of a heart attack hitting me out of the blue, my doctor discovers early on that I have high cholesterol and prescribes me Lipitor which costs about $300 per year, and that is even lower if you go generic. My heart problems get taken care of for much less money, plus I didn’t have to go through a high-risk surgery and brutal recovery. 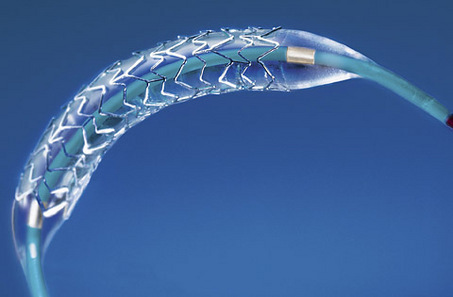 But maybe Lipitor doesn’t work, so after a while they find my coronary arteries are severely blocked and I get a stent (of course, I only use a Medtronic brand stent). I have a non-invasive surgery where they insert the stent through a tiny incision in my hip, I go home that evening, and it all costs me about $20,000. Like before I probably would have a much better outcome than Grandpa Fox, at about three times the cost which equates to about 2.4% inflation over the 50 years. So while medical expenses have skyrocketed (and I totally agree they are out of control), if you look at the idea of taking someone with a heart problem and getting them back to health, prices have actually gone way down since 1965. So much for aggressive inflation here; you could actually argue that there has been deflation. So let’s compare apples to apples, literally. Apples in 1965 cost about 16¢ per pound while today they are about $1 per pound (at least in LA)—that equates to inflation of about 3.6% inflation. But there is actually a difference between 1965 apples and 2015 apples. Back then there was this weird concept of fresh fruits and vegetables being “in season.” You could only buy apples certain times of the year which was around late summer and fall (I had no idea so I actually had to look this up, which kind of proves my point). Today fresh fruits and vegetables are in season when your grocery store is open and you have money. So again, you’re paying more but you’re also getting a better product as well—year round fresh fruits and vegetables. And there are many product categories whose prices have fallen drastically (air travel, anything with electronics), and others that we used to be charged for but are now free (telecommunications, news articles). The whole point of all this is that depending on how you look at it, inflation isn’t going to be nearly as high as the CPI says which is a huge help to savers. That means your dollar will stretch further in retirement than you might otherwise think, and that you’ll need less to retire on. Consider this my gift to you. 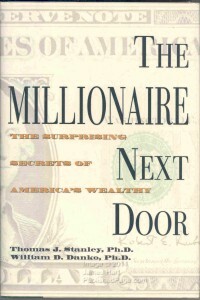 The Millionaire Next Door definitely deserves a place near the top of any list of books on personal finance. 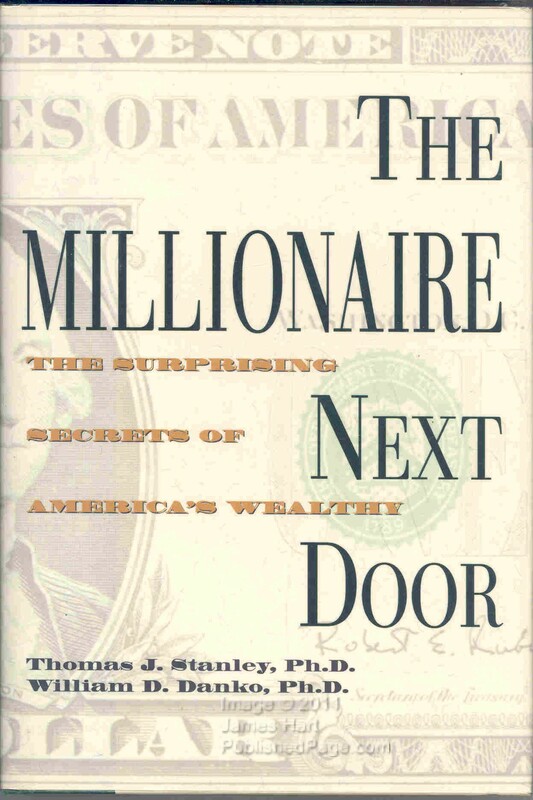 Its two authors, Thomas Stanley and William Danko, were two professors who undertook a massive study of America’s millionaires to figure out what made them tick. How did they get rich? How did they stay rich? And generally, what are their views on money? Reading this is almost like watching an archaeological documentary on PBS with Will Lyman narrating: “Americanis Millionairo is a subspecies whose prodigious wealth-building abilities have been studied for centuries.” Basically, the authors conducted thousands of interviews with millionaires and asked them questions on nearly every subject of personal finance, and the book is those survey results. Nearly every aspect of millionaires is examined to find common themes—working income, country of origin, education, divorce status, occupation, Rolex-ownership, and a hundred others. Frugal spending habits are the single biggest factor to being able to become a millionaire. Flashy spending occurs among a small minority of millionaires, and in fact flashy spending tends to be a major factor to not becoming a millionaire. For those aspiring to be millionaires it’s a wonderful how-to guide on becoming rich the slow-but-steady (and boring) way of spending less than you earn, making luxuries an special indulgence instead of a daily staple, and generally have a grounded view on life and expenditures. It’s analysis shows that most millionaires get that way by prudent spending and diligent saving; not by having jobs that pay million dollar salaries, not by inheriting the money from rich relatives, and not by “hitting it big” in some venture. It’s this element of the book that is most powerful—it democratizes millionairehood (I just made that word up). For those who are already millionaires and became so by leading a life with “sensible spending”, I think it provides comfort that they aren’t alone. Our society is bombarded with images of what “rich” people should look and act like. In the 1980s shows like Lifestyles of the Rich and Famous (I must confess a favorite of mine as a kid) celebrated the over-the-top extravagance of the wealthy. That tradition has continued with a myriad of shows like Platinum Weddings (a favorite of Foxy Lady) and Million Dollar Rooms to name just two. However, the book does a tremendous job of breaking through those stereotypes to show that the vast majority of America’s wealthy are just normal people who spend their money sensibly or even frugally. In true academic fashion (one of my criticisms of the book is that is reads more like a research paper than a bestseller, but it is a best seller, so what do I know?) the authors break down pretty much every demographic element of millionaires and just as interestingly, those people who make a bunch of money but aren’t millionaires. Some of the findings are obvious like there are a lot of millionaires who started their own business. But others are make a ton of sense but wouldn’t have been top of mind as such a determining factor; an example of that is divorce which the authors describe as a millionaire killer (Foxy Lady—have I told you how much I love you?). They slice and dice things and thousand different ways. What do you want to know about your average millionaire? Average age of car (2-3 years), percentage self-made (80%), attended public schools (55%), ancestry (Russian followed by Scottish), percentage who have a JCPenney card (30%), and on and on. Of course, I look at these things through an investing lens, and I was a bit disappointed that the authors spent so little time on this subject. In a book with almost 300 pages, only about 4 or 5 are dedicated to what millionaires do when investing their money. And this seems like a major gap considering that investing can be as responsible for building wealth as earning the money in the first place. They cover the most the millionaires have paid for a suit, a watch, a pair of shoes; but they don’t talk about what type of investments they make? Seems weird. About 80% of millionaires do invest in stocks and other securities. This seems obvious, and actually a little low. What are the other 20% doing. Most use a “buy-and-hold” investing strategy as opposed to actively and frequently trading stocks. I’m glad to see this (this is a topic for another blog post). Considerable time is spent discussing how millionaires go about hiring a financial advisor. If I had my way I would have loved the authors to really dive in here. If you believe that the point of the authors writing this book is to show the masses how they can become millionaires (and I believe that to be true), then after they adopt the “frugal” spending habits, then it becomes important to know what to do with the money after they’ve saved it. Here is my list of a few questions I would have loved to know: What percentage use a financial advisor versus do it themselves? Do they tend to invest in individual stocks or mutual funds? How much of their portfolio is in stocks versus bonds? Overall, the book reads a little stiff, and at some times it gets preachy (especially the section on how to discuss money matters with your kids) so that’s a bit of a turn off. Also, it was written in 1999 and because of that there are a lot of areas that are quite dated and don’t really apply to the world 2015. But it does provide tremendous insights into their everyday activities of these people and how those have help them accumulate so much wealth. For all that it gets 2 ½ stocky foxes. As a closing note, I want to thank my coworker who gave me this book as a Christmas gift back in 1999. You know how you are, and I hope you know how much I enjoyed reading this. The week was dominated by moves (or anticipated moves) by central banks. We had a pretty flat week until the bottom fell out for everyone. 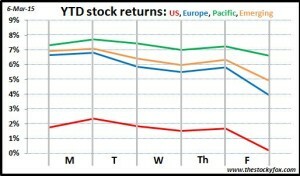 Pacific stocks did the best (Thank you China) being down only 0.7% while the US and Emerging stocks were down about 2%. That leaves the European stocks which really got hit hard, down almost 3%. Wow!!! So what caused it all? 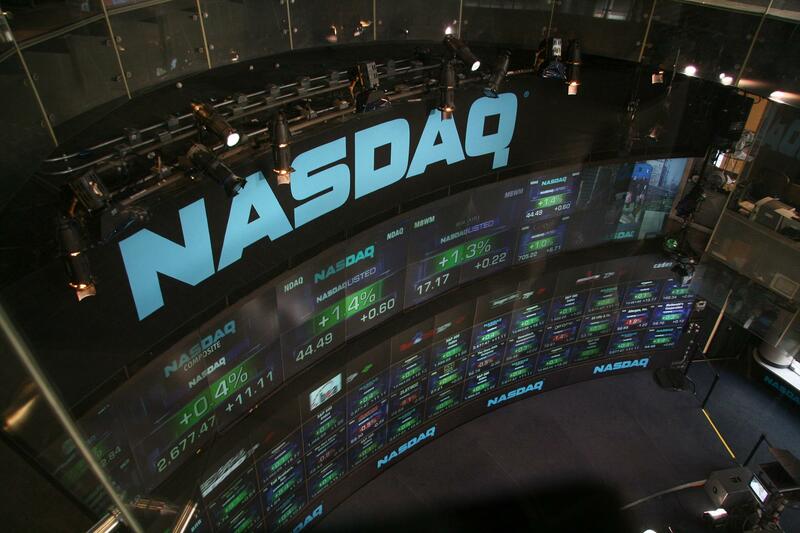 On Monday Wall Street celebrated a bit of a milestone when the NASDAQ returned to above 5000 for the first time since the internet bubble popped 15 years ago. It wasn’t a story to drive the market, as much as it was a story about how the market has been driven by amazing companies like Apple, Whole Foods, Amazon, eBay, Amgen, Cisco, and others. Of course that didn’t stop all the news outlets from devoting considerable time to remembering 15 years ago. My favorite part was looking at the CNBC footage from then and the hairstyles in vogue at the time. You never realize how much those things change, even in a few years, but man do they ever. Interestingly, the milestone did prompt a lot of soul-searching as to whether or not we were in a bubble now, the way we were back then. 15 years ago, a lot of people got taken up in the euphoria of the skyrocketing stock market, only to get crushed when the party ended. It’s natural to want to look at that now to avoid those painful experiences, but as we learned in A Random Walk Down Wall Street, crashes are really hard to predict. Overall, this was a nice trip down memory lane, but nothing that really had meaningful implications for the markets. Janet Yellen isn’t the only central banker that can monkey with interest rates to drive markets. The week started on Monday with China lowering its key interest rate. As you would expect, this had a very positive effect on Pacific and Emerging markets. However, this is always a bittersweet move, and one that may have some major implications in the future. China is lowering its interest rate to spur economic activity because it thinks its economy is slowing. In the past several years, China has been a manufacturing juggernaut, so to think that the second biggest economy in the world may be slowing down is not a positive for stock markets. In a similar story in a different part of the world, the European Central Bank announced that it would mimic the US’s quantitative easing program by buying over €1 trillion (trillion with a “t”) in bonds. Broadly speaking, the European economy is a mess right now. At best you have the stronger economies experiencing slower growth, and at worst you have Greece in shambles and other countries like Italy and Spain thinking about following Greece’s “budgets be damned” path. Certainly quantitative easing seems to have worked for the US (but the jury is still out as to its long-term effects), but Europe is in a very different place economically and politically compared to the US. You kinda get the sense that the ECB is just throwing a bunch of “stuff” against the wall and see what sticks. Not surprisingly European markets were down more than anywhere else, although they had a slight recovery on Thursday with this news (which was erased and then some on Friday). 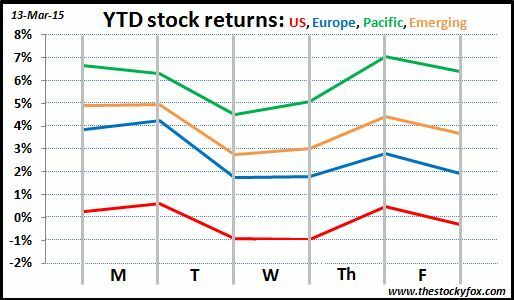 There is no doubt that lowering interest rates (what China did) and providing liquidity (what Europe did) has a positive short-term effect on stocks. But it’s like eating sugar; that gives you a short burst of energy, but it’s not sustainable in the longer term. Continuing that analogy, a healthy body needs real food instead of sugar, just like a healthy economy needs earnings growth instead of government stimulus. That’s why the markets were up on the day the stimuli were announced but have since fallen lower as people realize the state of the economy as the reason “why” the stimulus was needed. 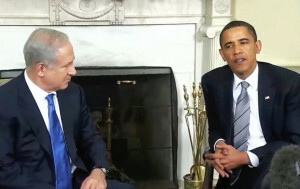 When the Israeli prime minister spoke to Congress (without President Obama’s blessings) on Tuesday he took the gloves off and started blasting the Obama administration’s proposed treaty with Iran over its nuclear program. As the speech went on and became increasingly belligerent, stocks softened moderately, but oil started to increase. The fear of course is that Netanyahu’s speech portended armed conflict in the volatile Middle East. A regional conflict wouldn’t be that big of a deal since the Middle East only represents about 3-4% of the world economy; that’s a significant amount but not a lot. The initial concern is oil and the disproportionate amount that is produced there, and you saw how the threat of war impacted oil prices for a day (of course, the enormous glut in world oil reversed those gains quickly). The bigger concern is that region has a tendency to draw other countries into its conflicts, especially the US. As we know, wars are expensive and tend to be bad for the stock market as a whole (although good for particular industries like defense). While the odds of that are pretty slim in my opinion that there is another Middle East war in the US’s future, Netanyahu’s speech showed the chances are rising, and the stock market acted accordingly. This is actually a big deal. Healthcare has been one of the huge drivers of the US economy (and the world economy) during the past several years. The Affordable Care Act really reshaped the landscape of the industry, and was largely seen as a boon to healthcare companies who started receiving more customers because of the insurance mandate. Additionally, the government’s subsidies of insurance for lower-income people acts as a huge financial injection from the Treasury to the pockets of the health care industry. As the Supreme Court reviews a key provision of the law, there’s the potential that all of Obamacare could unravel (certainly something the Republicans want). That would be bad for the health care companies for sure. When news came out that Justice Kennedy made some comments that seemed skeptical of the challenger’s case, hospital stocks rose sharply. But even the uncertainty surrounding all this is bad, making it really hard for these companies to plan very far into the future, and I think that’s another reason that generally you saw stocks soften this week. Friday’s news was dominated by the jobs report. The good news was that employment was up, with the jobless rate being at its lowest level in about seven years, so that definitely seems to be a good thing (although the calculation is kinda weird because it doesn’t include people who have stopped looking for jobs). However, the types of jobs are not high-paying jobs as reflected by the fact that wages were flat. This means that more people are working, but they are tending to be lower paying jobs which is definitely a sign of underemployment. Overall this has to be net good news, but of course it would be better if both employment and wages were rising for the economy. Interestingly markets were down sharply on this news, which is counterintuitive; I think it’s probably because this good news makes it more likely the Federal Reserve will raise interest rates sooner. But of course, that would change a million more times in the next few weeks. So there you have it. A bit of a bummer of a week for the markets considering we were on a pretty sweet winning streak. 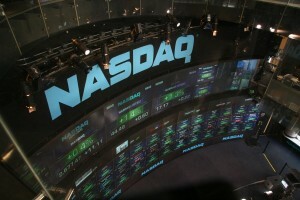 Unfortunately, except for the NASDAQ 5000 celebration (ironically, the NASDAQ promptly fell to 4980 after it hit its mark) there seems to be some developments that are genuinely concerning. I hope you have a great weekend and I’ll see you tomorrow with my review of The Millionaire Next Door.